Today is episode number 94, get pumped. Be sure to check back every Tuesday for a new episode, and head over to iTunes or Stitcher to subscribe! To leave a review for the podcast (OR JOIN IN ON THE APPLE WARS!!) go to: http://coconutsandkettlebells.com/review. I would appreciate hearing from you more than I could possibly say! 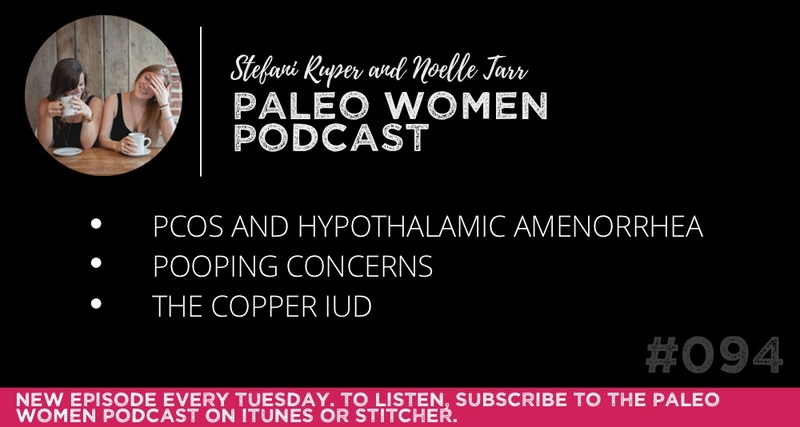 This week, Noelle and I discuss PCOS and hypothalamic amenorrhea, pooping concerns (Noelle named this one), & the copper IUD. Got a question you’d like us to answer? Email us at paleowomenpodcast@gmail.com. 10% of the funds we receive from our sponsors is donated directly to our partner charity, Thistle Farms, a place where women survivors of abuse, addiction, trafficking and prostitution receive help and support through residential programs, therapy, education, and employment opportunities. Because we get paid per download, you are actively supporting Thistle Farms by downloading our podcast each week. If you’re interested in helping people find resolution with nutrition and lifestyle changes, the Nutritional Therapy Association can help you pursue your passion. The NTA offers foundational holistic nutrition education through two distance learning program, the Nutritional Therapy Practitioner Program, and the Nutritional Therapy Consultant Program. Each program allows you to have the flexibility of self-paced study, while still providing in-person support with instructor-led workshops. When you sign up for one of the programs, write the name “Paleo Women” in the referral section on the application, and you’ll receive $100 check back in the mail to put towards supplies. To learn about how you can become a NTP or NTC, check out the course catalogs and program information at http://nutritionaltherapy.com.